Interested in learning more about Healthy Communities? Contact Kristin Hughes Srour, Director of Special Olympics Global Health Programs, at khughes@specialolympics.org. Access materials designed to give users an overview of Healthy Communities and year-round health programming. Learn how Special Olympics Healthy Athletes® events and Healthy Communities programming are closely-linked and complementary for maximum impact on the health and well-being of athletes. Healthy Communities Criteria: Healthy Communities Criteria Descriptions for Program Recognition. Healthy Communities One-Pager: Healthy Communities one-pager. Special Olympics Annual Health Report: The report lists Special Olympics Health activities from 1 April 2017 to 31 March 2018. 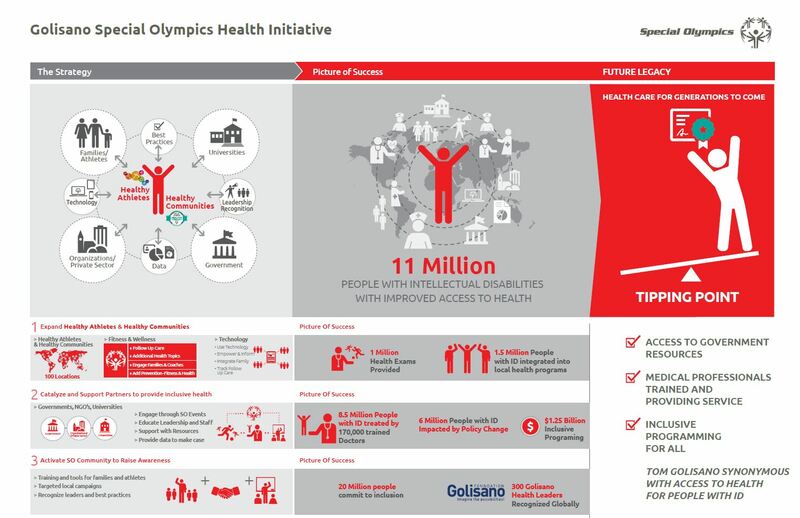 Health Strategy (Infographic): Review this one-pager that shares a big-picture view of the Special Olympics health strategy for the next five years. 2016 Project Overviews : A summary of all the 3 year and 1 year Healthy Communities projects funded globally in 2016. Recognition Criteria: Programs that achieve these six criteria can be recognized as an official Healthy Community. Guide for Programs: The purpose of this overview guide is to inform Special Olympics Programs how they can become recognized as a Healthy Community. Health and Intellectual Disability: This one-pager focuses on health and intellectual disability research. Healthy Communities Pitch Deck: This PowerPoint is designed for Special Olympics Program personnel to use or to customize when marketing Healthy Communities to potential partners. Low-cost Innovative Practices: Information on low-cost, innovative ways of incorporating health into your programming. Video from Chairman Tim Shriver: Access this four-minute video in which Tim Shriver outlines the need for Special Olympics to focus on building Healthy Communities and challenges community partners to do more. Letter from CEO Mary Davis: This letter from November 2015 shares a big-picture outlook of how the 5-year health strategy will impact Programs and communities. 2015 Press Release – Gift from Golisano: This press release from July 2015 highlights how the largest gift in Special Olympics history shared by the Golisano Foundation - will help build inclusive communities in health. Healthy Communities: Learn how Healthy Communities aim to increase the reach and impact of Healthy Athletes. Health Highlights Part 1: Learn how to increase the impact of Healthy Athletes events across a broad spectrum of stakeholders. Health Highlights Part 2: Learn how to increase the impact of Healthy Athletes events across a broad spectrum of stakeholders. Health Highlights Part 3: Learn how to increase the impact of Healthy Athletes events across a broad spectrum of stakeholders. Health Highlights Part 4: Learn how to increase the impact of Healthy Athletes events across a broad spectrum of stakeholders. 1 Year Grants: Learn how your Program can lead the way in changing the healthcare system for people with intellectual disabilities. Special Olympics goal is to reach 100 Programs recognized as Healthy Communities by 2020. 3 Year Grants: Please note that Programs with demonstrated success in 1-year Healthy Community Grants and/or proven success in health programming will be selected to apply for 3-year Healthy Community Grants. Please contact your Regional Healthy Athletes Manager if you are interested in receiving a 3-year Healthy Communities Grant. Visit this frequently-updated site to access the latest materials developed and shared by and with Special Olympics Programs that are working within their communities and with partners to break down barriers experienced by people with intellectual disabilities when seeking access to quality health care, services and education. Ready to Apply for Recognition? : If you are ready to apply for recognition, please contact your Regional Healthy Athletes Manager. Click for their names and email addresses. Guide for Project Planning: A project planning document that will help you analyze the unmet health needs faced by athletes and others with intellectual disabilities in your Program or local community, and develop strategies to address the underlying causes. Template for Project Planning: The Project Planning Template for 3-Year Healthy Communities Projects. Annual Report: Click here to complete a report on the Program’s progress on the Healthy Community Recognition status. Download materials on follow-up care - or what happens after a Healthy Athletes exam – which is an essential component of Healthy Communities programming. Toolkit: Toolkit designed to outline ways Programs have successfully provided and tracked follow-up care. Tip Sheet: Helpful tips for Programs on how to support and track follow-up care for athletes after examinations. Planning Template: Use this template to assess the needs, actions to take and desired results when following up on athlete care after examinations. Tracking Template: This spreadsheet should be used to track follow-up care for athletes after examinations. Training Health Care Providers Toolkit: Toolkit designed to outline steps Programs can take to provide training and education to local health care providers. Blood Pressure FAQs: Questions and answers on blood pressure to guide conversations with Special Olympics athletes and their caregivers. Body Mass Index FAQs: Questions and answers on measuring body-mass index, a screening tool to identify possible weight problems. Bone Mineral Density FAQs: Questions and answers on follow-up care for athletes diagnosed with low bone mass or osteoporosis. Access tools for athletes, coaches and families related to self-advocacy, education and community activation. Local Partnerships for Wellness Toolkit: Toolkit designed to outline ways your Program can collaborate with local organizations and businesses to provide year-round opportunities for people with intellectual disabilities. Health Heroes: Presentation shared by South Africa focused on athlete leaders interested in serving as health heroes. Health Heroes Athlete Leadership Course: This 6-slide PowerPoint is aimed at Programs teaching athlete leaders about health and has been used by such Programs as Special Olympics South Africa. Athletes as Health Coaches Toolkit: Toolkit designed to outline ways athletes in Special Olympics Programs champion health within their communities. Family Health Forum Toolkit: Information for Programs interested in hosting a Family Health Forum, an event designed around locally-relevant health topics that engage families of those with intellectual disabilities, sponsored by Lions Clubs International. Revised in 2015. Healthy Habits Station: Information shared by Special Olympics Wisconsin on teaching preventative care practices and providing educational resources. SO Florida Coaches Nutrition Guide: A coaching re-certification tool Special Olympics Florida has developed. SO Florida Coaches Nutrition Toolkit: Toolkit developed for coaches. Intro to SO Florida Nutrition: Learn about the coach recertification that SO Florida developed on sports nutrition. Wellness Wednesdays: Content you can use on social media for #WellnessWednesdays. Fitness Tracking Tool: A resource for tracking the impact of your Fitness Program. Athlete Lifestyle Survey: For use in your Fitness Program as a pre/post test for athletes. Athlete Tracking sheet for Fitness: An at-home tool for athletes to track their progress meeting their fitness goals. Gaining Access to New Fitness Resources: Learn about SOI's new fitness resources and have fun learning, moving, experiencing, and tracking your movement. Fitness Partnerships: Learn about new partnerships formed with SOI to support Program fitness. Hear from fellow Programs sharing their success in developing and nurturing fitness partnerships. Fitness Models and Best Practices: Learn about 3 SOI endorsed and supported fitness models, hear about other US Program's innovations in fitness, and create activation plans for your Program. Fitness in Special Olympics: Learn about SOI's fitness strategic plan, including the vision, goals, strategies and metrics. Program staff share best practices and demonstrations from Canada, British Columbia, and Ontario. Special Olympics global health work would not be possible without the thousands of health care professionals and students who volunteer and who share they increase their understanding and skills because of their involvement with Special Olympics. Healthy Athletes Course Template: Presentation on athlete leadership in health, developed by the athlete leadership program team. Athlete Leaders in Health: Learn how to find partners and strengthen relationships to enhance your health work. Hear tips to engage Clinical Directors, community organizations, local and state government, funders, and athlete leaders. Athlete Impact Story: Learn from Loretta Claiborne about the importance of athlete health and opportunities to improve healthcare for people with intellectual disabilities. Share evidence of Special Olympics’ impact. Special Olympics is the largest global public health organization dedicated to people with intellectual disabilities, and our data clearly indicates a need for societies to do more. Health Research: These resources can be used by Program team members to educate others on why and how Special Olympics changes attitudes. This is at the crux of the Special Olympics movement and a focus area in the 2016-2020 Strategic Plan. Special Olympics Health Program Identity Guidelines: These guidelines explain how to implement Healthy Athletes event identity and how to recognize Programs that have achieved the recognition as a Healthy Community. Health Branding: Get access to files, documents, templates and logos that are designed to support Special Olympics Programs with marketing and hosting health-related events and programming. Telling Your Story: Communications & Research: Learn about tools and strategies to help you tell stories with images and data. Special Olympics Health program is made possible by many dedicated partners and volunteers. Learn more about some of our partners here. American Academy of Developmental Medicine and Dentistry: Organized in 2002, AADMD provides a forum for healthcare professionals who provide clinical care to people with neurodevelopmental disorders and intellectual disabilities. American Association on Health and Disability: Visit the official American Association on Health and Disability website. Association of University Centers on Disabilities: Visit the official Association of University Centers on Disabilities website. The Golisano Foundation: Visit the official Golisano Foundation website. Lions Clubs International: Visit the official Lions Clubs International website. U.S. Centers for Disease Control and Prevention: Visit the official CDC National Center on Birth Defects and Developmental Disabilities, Centers for Disease Control and Prevention website. World Health Organization: Visit the official website of the World Health Organization, an international public health organization of the United Nations. There is a section dedicated to disabilities, along with information on other health conditions. Healthy Athletes events are essential to a Program becoming a Healthy Community. Healthy Athletes events provide free health exams to athletes in more than 130 countries. All Healthy Athletes Resources: Get all the forms, information, tools, tips and research you need to run, promote and grow one or more Healthy Athletes disciplines. Find resources for holding a Champions for Inclusive Health meeting in your state or country. Please note that these resources are being developed collaboratively by SOI, SO British Columbia, SO Indiana and SO Nebraska and are still a work in progress. For More Information: Contact Bryn Nolan for more about Champions for Inclusive Health. Case Statment: Making the case using data that meeting the health needs of people with intellectual disabilities would lower health care costs in the US. Action Planning Template: This template is to be used by stakeholders to capture their proposed action plans in an effort to be more exclusive. Program Level Workshop Agenda: This document is a sample program level workshop agenda that includes the potential ways in which the sessions can be carried out. Checklist: Programs are welcome to use this checklist during their workshops to aid in planning. Stakeholder Identification Template: This new document will help programs select and list potential stakeholders. Healthy Communities Evaluation Results: Executive Summary: This executive summary reviews the main themes from the full evaluation report and can be used to provide an overview of Healthy Communities and strategies for success. Healthy Communities Evaluation Results: Full Summary: This report reviews the results from an evaluation project conducted with Healthy Communities Pilot Programs from 2012-2015. The results highlight the key activities and strategies that Pilot Programs used to increase access to health and health care for people with intellectual disabilities. Challenges and solutions for adapting Healthy Communities to various Programs are also discussed. Learn how your program can conduct a stakeholder workshop in your local area. Here you will find a toolkit, interactive templates, and more information on how to conduct an Inclusive Health workshop. How to Guide: An Inclusive Health Stakeholder Workshop Toolkit: Learn best practices, how to host your own workshop, and understand how engaging stakeholders within your community to reduce health disparities for people with ID. How to Guide: An Inclusive Health Stakeholder Workshop Toolkit- Readable: This is an easy read version of the toolkit above. Interactive Tools from Toolkit: These interactive tools can be used by programs who wish to host their own workshop. Programs are able to tweak the information to better suit their desired outcomes or to include more state-specific data.